This is the second year of The Spirit of the Carnival, which was created by local family owned Island pubs, working together, to help support the traditional Island’s Carnivals. 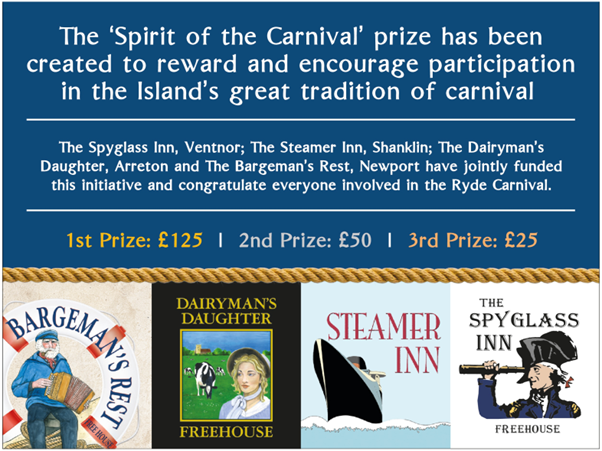 The pubs are happily donating 1st, 2nd and 3rd place cash prizes for The Spirit of the Carnival. To be eligible for one of the prizes you need to take part in both the Main Carnival and the Illuminated Carnival. The Carnival dates can be found here, and the Carnival Entry Form can be found here. After the Carnivals, why not pop in to The Bargeman’s Rest in Newport, The Spyglass Inn, Ventnor or The Steamer Inn, Shanklin. Perhaps take a small drive out and relax in the countryside setting of The Dairyman’s Daughter in Arreton. You’ll be sure of great food, a wide selection of drinks and a warm welcome. The perfect end to a great Carnival evening.